Cherry season is about to explode, yielding crops flush with stone fruit. I can’t imagine a better time to get busy baking with my favorite farmer’s extra fancy Bing cherries – so tangy and sweet, their flesh firm and juicy. A quick car ride to San Leandro’s cherry festival last weekend fueled my desire to concoct this cheery dessert. 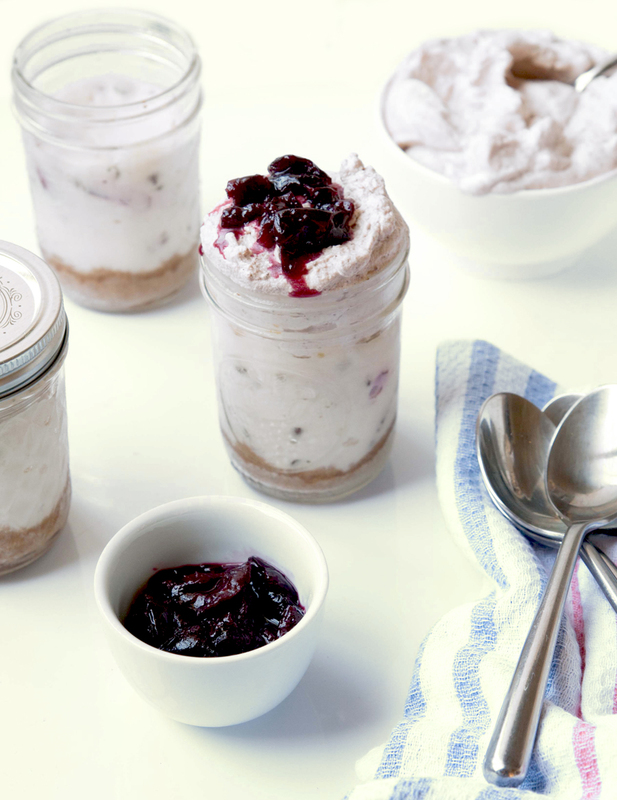 Baked in half-pint mason jars for easy transport to a picnic or potluck, these mini cheesecakes feature coarsely chopped cherries snaked through a yogurt and cream cheese custard. Mini semisweet chips add a hit of chocolate, and a quick cherry compote completes the decadence. If you prefer, you may bake them in 8-ounce ramekins instead of jars to cap off an indoor soiree on a sweet note. The small bit of almond flour in the crust adds both flavor and texture, but if you’d like to omit it, you may. I pulse my cherries in a blender to coarsely chop them for the cheesecake, but you can always take the knife to the cutting board instead. To top with an optional cloud of cocoa whipped cream, whip 1 cup chilled heavy cream to soft peaks, then whip in 1 teaspoon sifted powdered sugar and 1 tablespoon sifted cocoa powder. 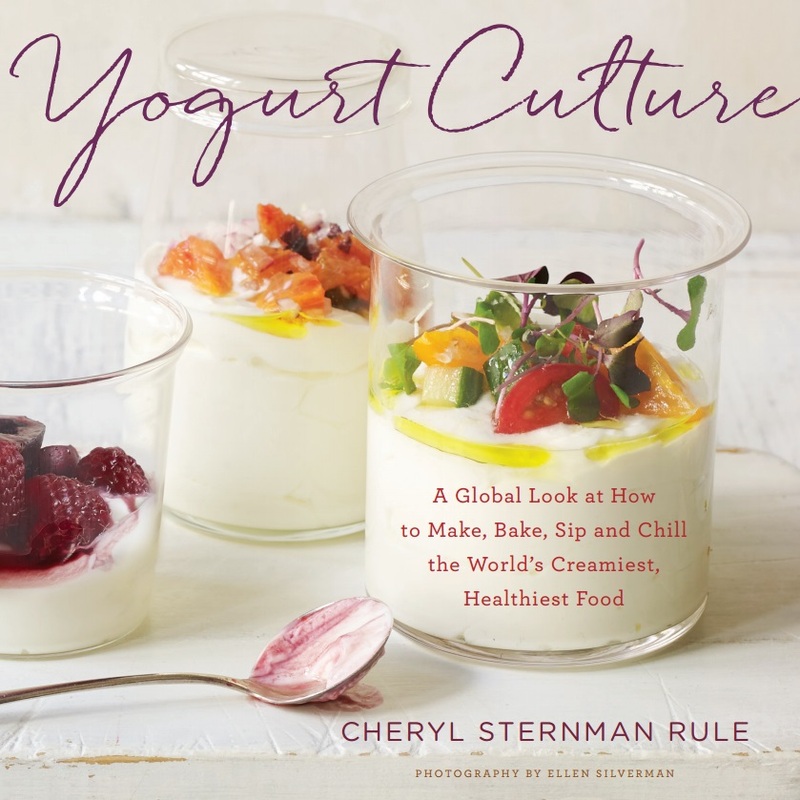 Spoon a dollop onto the cheesecakes before drizzling with the cherry compote. Make the crust. Preheat the oven to 325°F. In a food processor, finely grind the graham crackers. Add the almond flour, salt, and melted butter. Process for about 30 seconds longer, or until the butter coats the crumbs and the whole mess resembles wet sand. Spoon the crumbs into the mason jars, about 2 tablespoons in each, pressing to compact the crumbs. Place the jars on a rimmed baking sheet. Bake for 10 minutes, or until golden. Make the filling. Increase the oven temperature to 350°F. Using an electric mixer on medium speed, beat the cream cheese until smooth, 1 to 2 minutes. Add the eggs one at a time, beating well after each addition. Beat in the sugar, yogurt, almond extract, and salt until well combined. Fold in the chopped cherries and mini chocolate chips. Divide among the jars, placing roughly ½ cup filling in each. Bake the cheesecake jars. Place the jars in a 9 x 13 pan. Fill the pan with hot water so it reaches ¾ of the way up the jars. Bake for 25 minutes, or until the tops have set but still jiggle a bit when jostled. Remove the jars from the water bath and transfer to a rack. Cool on the counter for 20 minutes, then transfer to the refrigerator. Chill for at least 2 hours. Meanwhile, make the cherry compote. Combine the cherries and sugar. Let macerate for 15 minutes. Scrape into a small skillet, and set over medium heat. Simmer, stirring occasionally, until the fruit has softened and most of the liquid has cooked out, about 7 minutes. Stir in the lemon juice. Cool. Drizzle and spoon over each cheesecake (with or without the optional cocoa whipped cream referenced in the head note) just before serving.